The passing of the torch is a tough thing to watch. On one hand it’s a generation thing, but also a new path for those facing their own struggles and challenges. What is interesting in “Creed II” is the storyline that starts with the past in having Dolph Lundrgren’s Ivan Drago on the streets of Russia with his son, Viktor (Florian Munteanu). This is a major turning point in the story since his character is just there for a major shift in the overall tone and structure. Something I find so amusing is that the Academy does not like Spielberg, except when it just makes them look good. That is why he won Best Director for “Saving Private Ryan,” in a year where “Shakespeare in Love” was cleaning up at the Oscars. In great supporting turns are Tessa Thompson and Phylicia Rashad. Thompson is with Adonis and is on the verge of hitting it big on the music scene. Rashad is the widow of Carl Weathers’ Apollo Creed, who passed away in Stallone’s “Rocky IV,” one of the biggest hits in the 1985 year of American cinema. 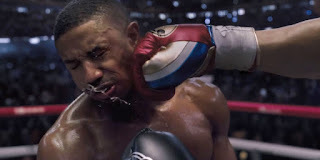 Going back to “Creed II,” Russell Hornsby plays a kind of Don King-like promoter who stages the fights and looks to give the boxers their big pay day. If he looks familiar that is because he spent the better part of a decade on the underrated NBC show “Grimm” as Portland cop Hank Griffin. Also making a very brief appearance is Brigitte Nielsen as Ludmilla Drago, Ivan’s ex and Viktor’s mom. She is no longer with Ivan, rather with someone who just takes care of her and satisfies her own ego and self-worth. The trouble is that at the end of “Rocky IV,” Drago was looked down upon by the masses as an outright failure and second-class citizen. When his son starts beating other champions, Drago finds a way to be looked at with honor and pride again. If one looks closely at the credits they will see that Stallone also contributed to the screenplay as well as producing credit along with colleague producers David Winkler, Irwin Winkler, William Chartoff, Charles Winkler and Kevin King Templeton. “Creed II” knows its pace and limitations, so it never settles into doldrums or a dry spell. There are a few hokey spots, but it comes with the territory.